When you run Spacebumfuzzle.exe, you’ll be presented with the configuration window. Select your resolution and general quality settings. Finer-grained graphical settings & control mapping can be found in-game. Your ship resources. The red meter on the left is the heat meter. The purple meter on the right is the energy meter. In the middle, from top to bottom, is the blue shield meter, the green armour meter, and the red hull meter. Minimap, showing how much of the current sector you’ve explored. Bases that you discover will show up here too. the “Boundbar”. This shows which weapons, abilities, and artefacts you have bound to each weapon key/button. Collectable resources (crystals, scrap, credits). New in version 0.8 is support points, shown in a bar in the top-right of the screen. Your ship level & XP. Heat – when you go over 100%, an alarm will sound and your ship will take hull damage over time. So while you can keep on fighting through overheating, it’s recommended you pop a Coolant Flush consumable to get rid of some of that heat, or take a breather from combat for it to cool down a bit. Energy – hard-hitting weapons and abilities will usually consume energy. This is intended to be a bit of a ‘throttler’ for high-damage things, so that you can’t just blow your way through all enemies too quickly. It means that you have to choose what your heavy-punch tools are – you can’t take too many! Shields – your shields can take quite a few blows and regenerate relatively quickly, so you can get into the thick of combat but still have to be careful about positioning and tactics. Armour – this is not fully fleshed-out yet, but you can purchase/find armour items to load onto your ship when you’re expecting heavy combat. More to come in the future. Hull – the integrity of your ship. When your shields are gone, and your hull is gone, you blow up and it’s game over. Time to reload and try again! XP – collect enough XP (either as event/mission rewards, or through damaging enemies and picking up the shiny blue ‘drops’ they leave behind), and you’ll achieve a new level and be rewarded with skill points. Skill points are used to upgrade your class’s abilities. Credits – used to repair your ship, buy weapons and equipment, hire a companion, and purchase maps from stations. Scrap metal – collected from the shredded hulls of ships, this is used to upgrade various aspects of your ship, your companion’s ship, and upgrade your weapons’ tier and level. Crystals – intended to ‘throttle’ access to the highest tiers of ship upgrades. Not implemented yet. The game out-of-the-box supports Xbox 360 and Xbox One controllers, and will switch over to controller mode as soon as you push any button on the controller. Using the left joystick you can point the ship in any direction. The Right Trigger will thrust your ship forward, and the Left Trigger will thrust it backward. You’ll start with a single pulse laser weapon, bound to the A button (as shown on the Weapon Bar on the left side of the screen). Any other controller should work, but you’ll need to configure the controls yourself. Instructions are at the bottom of this page. Caution: In the current alpha version, there use of a controller is limited to your ship. The UI is currently only usable with the mouse. There are a variety of different playable ships, each with different perks and slots. As such, you’ll need to know a few things about equipment. If you hover over an empty slot on your ship, it’ll tell you the equipment type that can be placed into it. If you click-and-drag on an item, any slot it can be placed into will glow yellow. Guns – this is the bulk of the weapons. From lasers, to shotguns, to railguns, to flamethrowers. 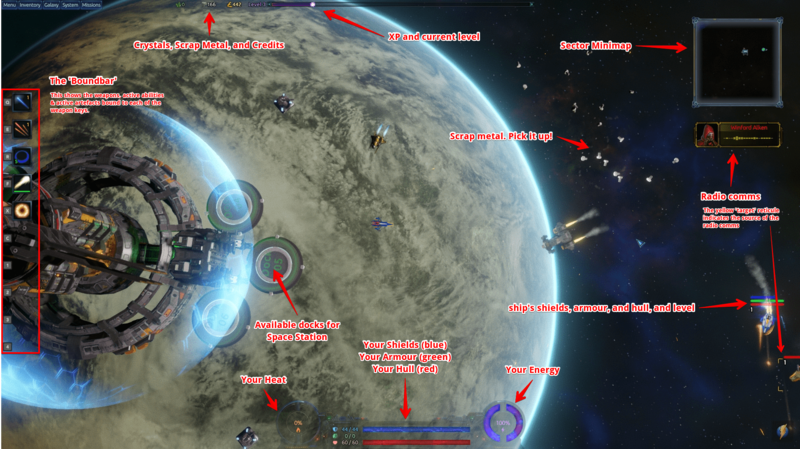 Missiles – most of these are heatseeking, chasing after the closest enemy. In the future the functionality may be extended to implement a ‘target’ key, which allows you to select a specific target. Also, there is one type of dumbfire missile (will be more in the future). Missiles have limited ammo, which regenerates over time. Bombs – there are several types of bombs, which all have a high energy use. More will be coming in future versions. Mines – this is a work in progress. There’s only one mine so far, so mine slots are temporarily reclasses as bomb slots. Shields – you will really want to keep an eye on new shield upgrades at stations. It helps a bunch! Heatsink – allows you to have a higher heat cap, and dissipate heat at a faster rate. Again, you’ll want to keep an eye out for upgrades at stations. Powersource – allows you to hate a higher energy cap, and generate energy at a faster rate. You’ll want to keep an eye out for upgrades at stations. Artefacts – while your starting class provides you with a few upgradable abilities, you can further customise your combat using artefacts. Artefacts provide either an active or passive abilities, at a pre-generated strength. Artefacts can be upgraded – for great cost – at a research station. Consumables – in the thick of combat, you might go over 100% heat and begin damaging your already-damaged hull. Pop a Coolant Flush to eject some of the heat! You may be lacking just that BIT more energy you need to fire a bomb and finish off a target – so pop a Capactor Injection to get that little boost you need! Crazy useful. And again, more consumables to come. Tiers are readily visible on an item by its background, border, and title colour. The items level number is indicated by the yellow number in the top-right corner. Stackable items’ stack size is indicated by the white number in the lower-left corner. Items that use ammunition have their ‘ammo count’ is indicated by the green number in the lower-left corner. The tier is indicated by the background, border, and tooltip title colours. Bonuses for the item are shown as +/- values in the tooltip. Press “i” key to load the inventory window, then simply drag-and-drop an item from your inventory onto any slot that will hold it. TIP: when you dragging an item, any valid slot will glow yellow. Give it a try! Unequipping is the same process – drag the item out of the slot, back into your inventory. Artefacts provide you the opportunity to gain abilities beyond the class you’ve chosen. They are rare, and can be upgraded at great cost. These are equippable in your ‘Artefact’ slots at the bottom-right of your ship in your inventory window. Active artefacts can be bound to weapon buttons like weapons and abilities. Guns, Missiles, Bombs, active Abilities, and active Artefacts can all be bound to weapon keys. These are listed on the left-hand side of your screen, and are themselves rebindable in the options menu. If you hover your cursor over any equipped weapon/artefact or ability that can be bound, it will pulse bright blue around the edges, and also cause all the weapon keys (on the ‘boundbar’ to the left of the screen) to pulse. While hovering the cursor, simply press one of the weapon keys to bind the item to that button. It’ll then be shown on the ‘boundbar’. Sometimes when an enemy blows up, he’ll leave behind a crate of loot which will contain equipment or credits. This only lasts for a certain number of seconds, so be sure to fly over it and pick it up. It’s not a problem to hoard equipment – your inventory will automatically expand to accommodate it. However, if you want to clear out unwanted stuff, either sell it at a spacestation (you’ll get ~1/5th of the buy price), or drag-and-drop it into space to destroy it. The options menu is where you can change a variety of visual and gameplay-related settings, change audio volume levels, and rebind your controls. To access it, while in-game, hit Escape to see the pause menu, and from there click “Options”. Please note that the options menu is not available from the main menu yet.